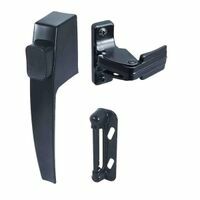 Replaces most storm door latches with 1-3/4 inch hole spacing. Fits most doors 3/4 inch to 2 inch thick. Features deluxe wide push paddle inside handle with night lock feature. Contains an inside escutcheon plate to hide any unwanted installation holes in your door. All installation hardware included.